To make packing easier for you, we encourage you to stop by the Adrift warehouse before 4 pm the day prior to launch and pick up a waterproof bag and any rental gear. You can also tell us where you are staying locally and you can request we drop off your dry bag in the lobby. This will allow you to leisurely and carefully pack the night before we meet you. Note the unique name on your personal bag so you can identify it later. Each person is given a waterproof duffel bag. 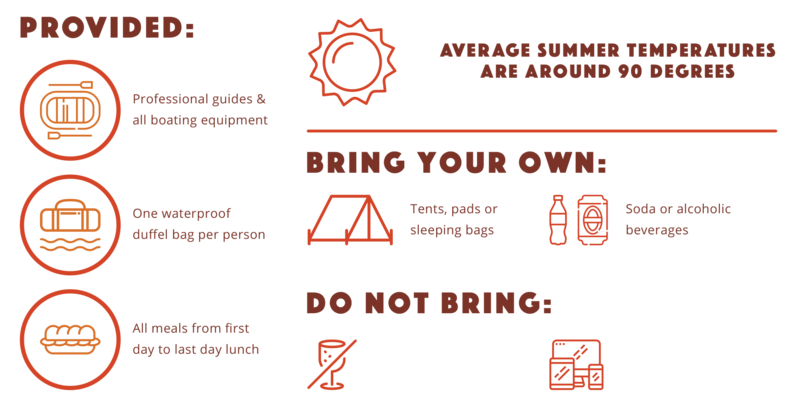 All of your personal items, such as sleeping bag and clothes, must fit in your personal bag, except for large tents for which we have a separate “tent bag.” Once packed, personal bags are given to guides at the launch site and after each breakfast and are not accessible until camp. Items which you will need during the day should go into a large waterproof duffel bag, called the “day bag,” which is available on each raft. If you want more immediate access to personal gear, consider purchasing a small waterproof bag at the Adrift store or bringing your own. Make sure you can properly close your personal bag or it will leak. Carry beverages, water bottle and special food items to the launch site and a guide will store them for you. The night before the trip set aside what you’ll be wearing on the river the next morning. Take time to pack everything on the Personal Gear Checklist. Pack all items for camp in your “personal bag.” Place the items you’ll want to go in the “day bag” in a small backpack, a plastic bag, or in a small waterproof bag. Items which we recommend being placed in the “day bag” include; sunscreen, camera (carry at own risk), raincoat, extra shirt (polypro), light sweater, binoculars and river guide or books.